Having a dedicated team of sales people is fastest way to convert strangers into life long clients. We have worked with some of the biggest companies as well as thousands of small businesses around the world helping recruit and train their people. 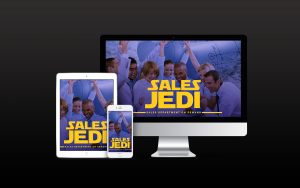 We specialize in the no pressure no hype sales system, we call it the Jedi Sales System. Bottom-line we’ll show you how to Effortlessly Close More Sales Without Using Pressure, Being Pushy, while Building Goodwill and Trust.